Contact – Spiers Custom Harmonicas- custom harps you can depend on! Please take a minute to describe your playing style, experience, and what type of harp you’re looking at. I need a good idea about how hard you typically play, to help me center the dynamic range of your instruments. If you’re interested in a custom harmonica for a specific purpose or goal, let me know about it. Filling out the form helps me keep things more organized, and gives me something to reflect on while I’m building your harmonica. I’ll usually reply with an email within a day or two, unless I’m off the grid. If you don’t hear back, please don’t give up! Sometimes emails seem to vanish into thin air, but sometimes it’s in your SPAM folder. If you don’t get a response, feel free to call me on the phone, my number is 816-449-0205. Or send an email to harpwrench, on gmail.com. Please read my price/description page before asking questions, it only takes a few minutes and the answers are often easy to find. Thanks! The better you can help me understand how you play, the better I can match the overblow response to your needs. 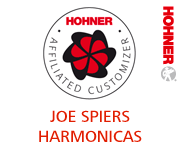 Hohner announced the introduction of the Hohner Affiliated Customizer Program at the 49th annual SPAH convention held in Irving, TX. Joe Spiers was awarded formal certification, making him the first affiliated customizer after Joe Filisko in the United States.